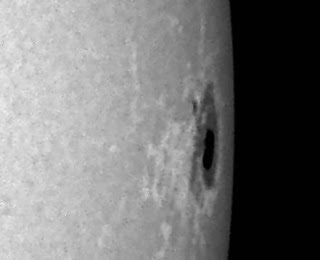 This is sunspot number 12665 just before it disappeared around the eastern limb of the Sun. It was captured on 17th July 2017 just before 11:00 hrs. It was imaged by a DMX camera attached to my 10-inch LX200 telescope. The original file was processed in RegiStax5 with wavelet enhancement and finished off in PhotoImpact.